These visits have been prompted by recent concerted attacks levied by the San Francisco Chronicle and the Newsom administration against San Francisco’s 20-year-old sanctuary ordinance. On July 30 and again on September 25, the Minutemen rallied under the auspices of the Newsom administration. They were opposed by a large and spirited crowd of counter-demonstrators on both occasions. Yet, the conduct and very physical posture of law enforcement officers on the scene made it clear that the counter-demonstrators – not the Minutemen – were regarded as suspect by City government. We, the undersigned, stand in solidarity with student, activist and poet Lamont (Dee) Allen, who was singled out and arrested for no good reason while participating in the July 30 counter-demonstration against the Minuteman Project. Mr. Allen was booked on trumped-up misdemeanor charges and held in police custody for nearly two days before his eventual release. The City is now prosecuting – and seems bent on making an example of – Mr. Allen, whose only “crime” is having the courage, as a Black man, to stand up against an aspiring lynch mob. 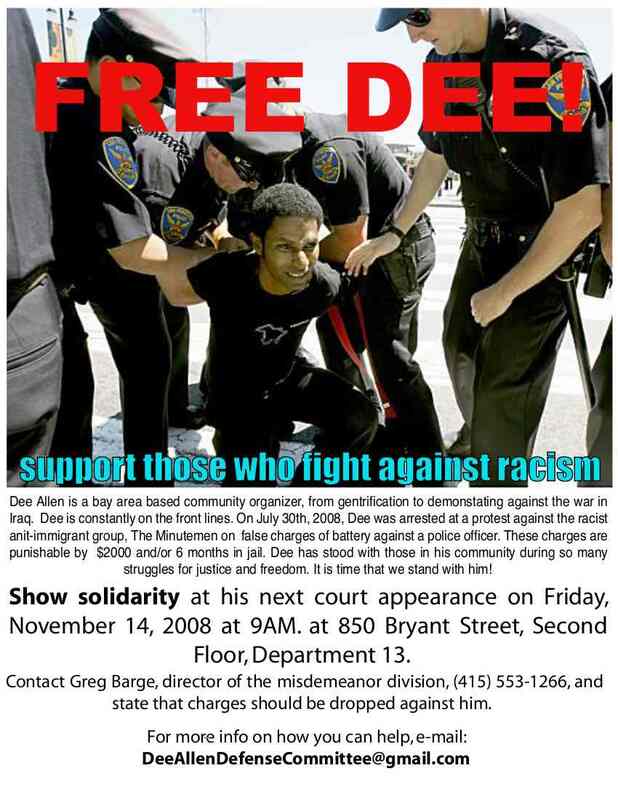 We are outraged that the City is pressing charges against Mr. Allen and demand that the charges be dropped.